Between July 18 and August 1, we organized and held an internship at the United Nations (USA, New York). Fifteen participants and supervisors traveled from St. Petersburg to the largest US city to learn everything about the world leading international organization and spend an unforgettable fortnight. 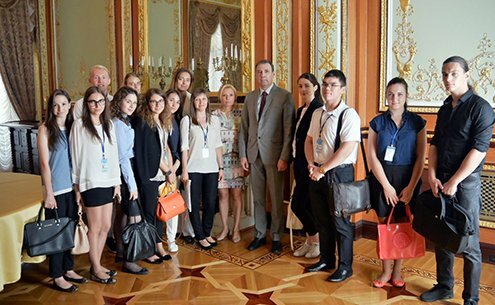 Participants learned how the work of the UN looked like inside, met diplomats of the Russian UN Mission, and the Consulate General of Russia, trained at the United Nations Headquarters, listened to lectures and took part in the workshops. The internship was aimed at not only training, but also obtaining new cultural and aesthetic impressions. The participants visited the Metropolitan Museum of Art, American Museum of Natural History, the famous skyscrapers of Manhattan, went on a sightseeing tour around New York, were at the Statue of Liberty, and watched Broadway musicals. Accommodation in the heart" of the city on the island of Manhattan provided a convenient vehicle access to the main attractions. Upon termination of the internship, we provided participants with certificates. So, additionally to precious new contacts and experience from other countries and cultures, they received documentary evidence of their educational experience. A visit to America and life in it are not possible without addressing a large amount of the organizational issues. Visa, flights, insurance, accommodation, food, travel, fear of being alone in a strange country — all these questions may be faced by anyone, and you have to deal with them on your own. However, our training addresses any challenges for our participants. We provided all services based on their wishes. All they had to do — is to collect the suitcase and be ready for new experience! The project has existed since 2007. During this time, it has involved more than 250 people. 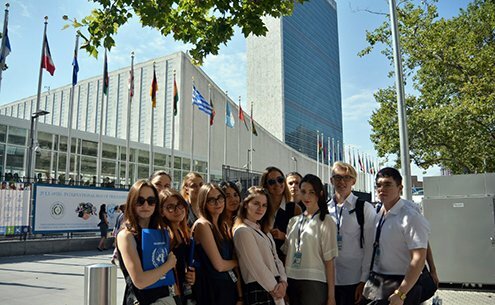 It has helped dozens of students became acquainted with the work of the major international organization in the modern world, took part in a unique program of the UN briefings, met with the acting Russian diplomats and others. Next internship at the United Nations will be on January 28 - February 4, 2017 (Switzerland), August 7-20, 2017 (Kenya).